My forecast of liquefied natural gas prices in Japan shows Oregon exports from Coos Bay might actually be profitable. The Jordan Cove Energy Project has faced highly politicized friction from regulators at both the national and state level, but its biggest obstacle has been the market itself. Until recently the spread between the price of natural gas they would buy in Canada’s Alberta Province and the price they would sell it in Japan has been too narrow to feasibly turn a profit. Now both prices are far enough apart that, had these intrepid investors been met with a more accommodating regulatory environment, many good-paying jobs might exist on Oregon’s southern coast that don’t exist today, depending on whether or not Pembina, the project’s backer, would have had the fortitude to go forward with this project in recent years when the numbers weren’t pointing toward profitability. 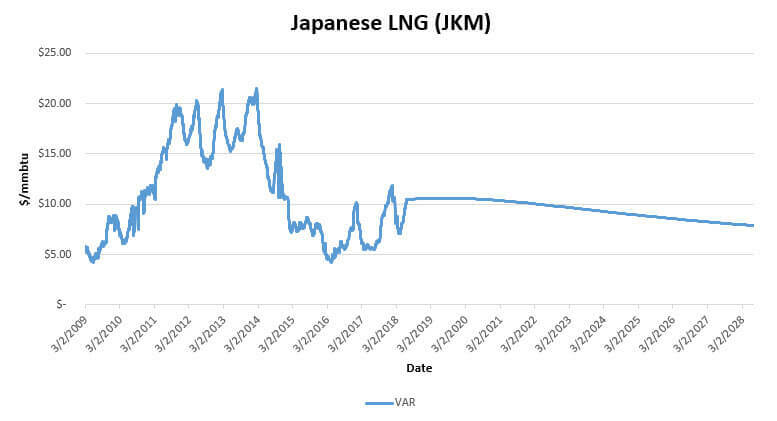 Japanese LNG (JKM) is hard to predict for several reasons, requiring some technical training in the latest econometric techniques. This is important because we want to know how long to expect prices to remain near current double digit levels. Methodologically, my preferred source for expected forward prices is not the use of statistical analysis but rather a futures trading market. Sadly, there is no open interest for a JKM derivative product. There is, however, a very liquid market in oil futures and natural gas prices tend to have a predictable relationship with them. So I regressed historical JKM prices on historical Brent prices. This OLS model was plagued with autocorrelation; so I used a VAR model instead. I then plugged in the Brent forward curve and discovered JKM will likely stay near $10 per mmbtu for the next ten years. Of course, when working to build a good forecasting model, it’s helpful to remind oneself that the problem might not be knowledge of technique but rather the inherent limitations involved in predicting the future. Knowing the risks, no doubt the folks at Jordan Cove are seeing similar numbers to those I am and are willing to take that risk. While this project’s political fortunes have improved at the national level, a major hurdle they face now is the Oregon Department of Energy’s Energy Facility Siting Council. Jordan Cove is seeking an exemption for the obviously legitimate reason that they are not selling energy to Oregonians. The facility will require its own set of three 30-megawatt steam turbines, because the Coos Bay area does not have enough transmission capacity to purchase that much additional power from our grid. So laws meant for the regulation of our electric market are technically triggered when an industrial site builds capacity greater than 25 MW. The Energy Facility Siting Council will be accepting written public comments on this case until August 13, 2018. Why not suggest they give the economy of Coos Bay a break and grant the exemption? This project has been delayed long enough. Just email your comments to [email protected] You can also voice your comments in person at the Council’s September 27th meeting at the Mill Casino’s Salmon Room (3201 Tremont Ave, North Bend).